By integrating Carrier Ethernet demarcation and PoE functions into a single device, Service Providers can easily deploy Wi-Fi hot spots and small cells almost anywhere, reduce equipment costs and overall power consumption. This integrated PoE NID speeds time to market and reduces technical risks. The GM4 PoE NIDs are available in two PoE power levels. GM4-PoE+ and GM4-HPoE models support 802.3af PoE (15.40W) and 802.3at PoE+ (34.20W) on each RJ-45 port. The GM4-HPoE models also provide up to 60W of power to access points for hot spot and metro cell applications. The GM4 PoE NIDs enable rapid service deployments, Service Level Agreement (SLA) assurances, comprehensive fault management and service protection. These advanced capabilities reduce operating costs, provide faster return on investment (ROI) and improve customer satisfaction. The standalone GM4-PoE+ and GM4-HPoE are available in 2, 4 and 5 port models, with up to four RJ-45 ports with PoE. They are DC powered with a terminal connector, or available with an external AC to DC power adapter. Built-in mounting brackets provide table-top and wall-mounting capability, and can also be rack-mounted using the 1RU 19” rack-mounting shelf. In the application example, a Service Provider offers metro/small cell coverage in addition to Wi-Fi hot spot services. 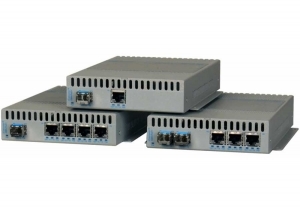 The multiport GM4 PoE NIDs provide full PoE power on each RJ-45 port. GM4 PoE NIDs are available with two SFP fibre ports, and support G.8032 Ethernet Ring Protection Switching to enable resilient ring configurations. On-board contact closure monitors the equipment enclosures for unauthorized tampering. The small cells and Wi-Fi access points can be located in an outdoor enclosure, inside a building, or both. 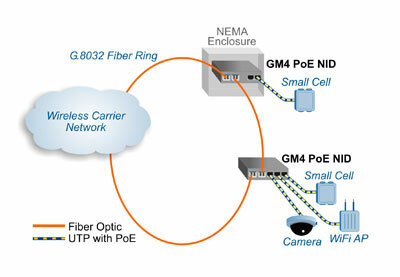 A GM4 PoE NID and the power supply can be installed in a compact NEMA enclosure for outdoor deployments.